If you like me, managed to infest your system with malware, or you want to check to see if you have, these are the steps you can follow. First, download MalwareBytes and Spybot from these safe locations. Install MalWareBytes, and run it. It will likely prompt for you do download the latest Database of threats. 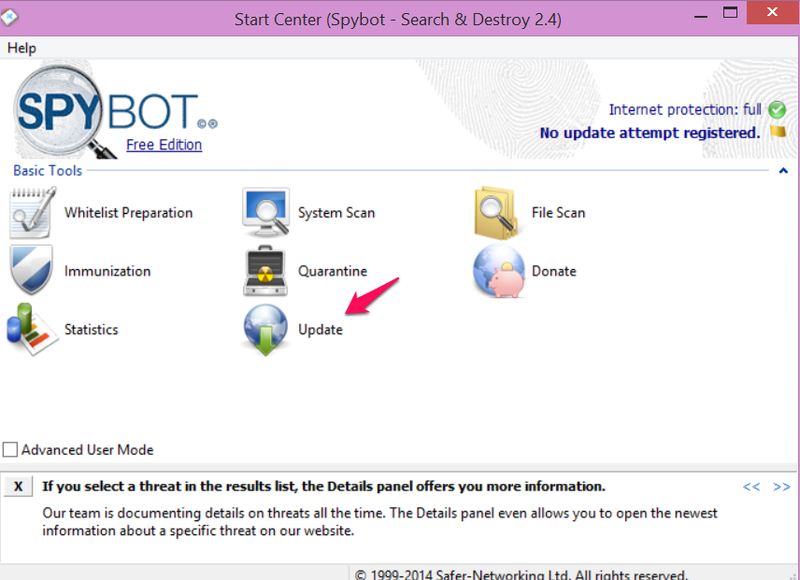 If not click the Update Now link on the Database Version line on MalWareBytes main screen. Do not, at this time run a scan. Exit MalWareBytes after the database has been upgraded. Next, install Spybot and run it. At the main screen, click Update. At the next screen, click Update also. And as with MalWareBytes,, do not, at this time run a scan. Exit Spybot after the database has been upgraded. When we run the actual scans, we want to be in Safe Mode. Safe Mode is a boot up option. It boots up your computer with just the bare minimum applications. That means any malware should not load into the computer, and not interfere with the scans. 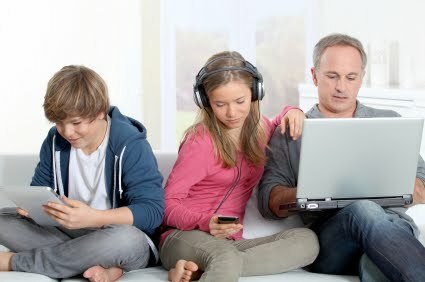 When the computer is booting, press and hold the Shift key, and tap the F8 key repeatedly until the Recovery screen appears. Click the See advanced repair options option on the Recovery screen. 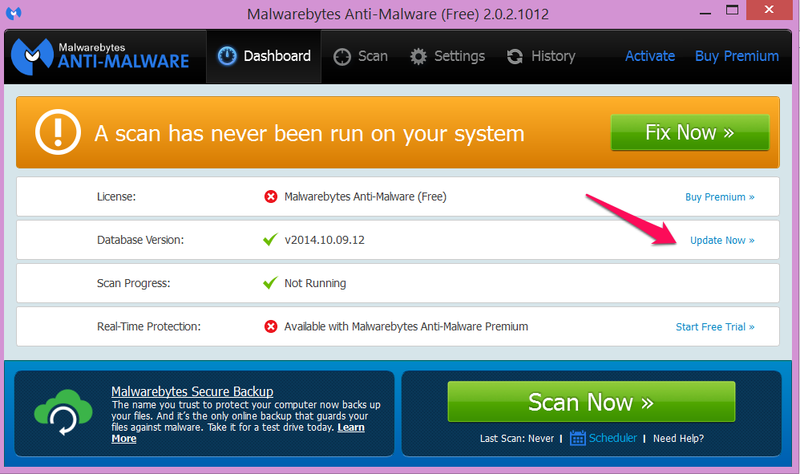 Once you are booted up in Safe Mode, run a scan with MalWareBytes. It may take overnight. 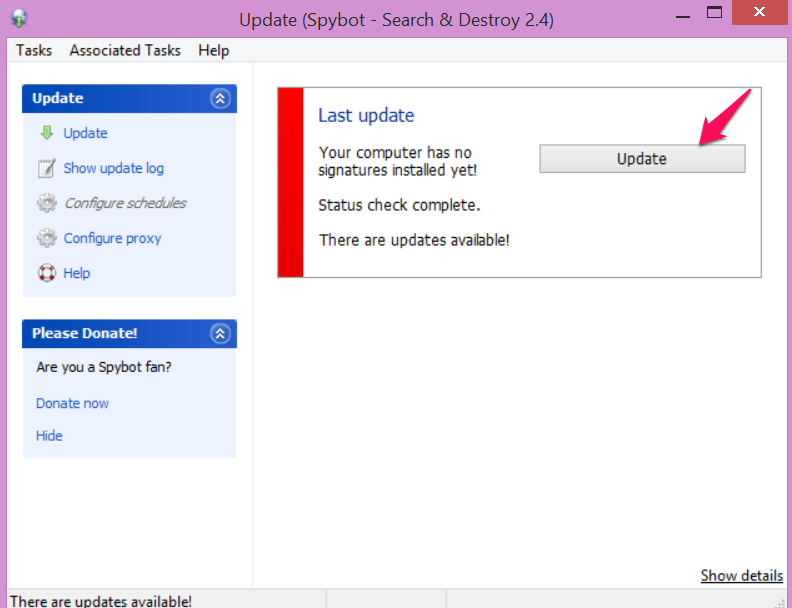 Once it is done, run a scan with Spybot. Once both scans are done, reboot your computer into its normal boot process. This process may not get all your malware, but it should be a good start before moving to more dramatic methods. Those we'll discuss in next week's column, on October 16, 2014 and its accompanying blog post here..